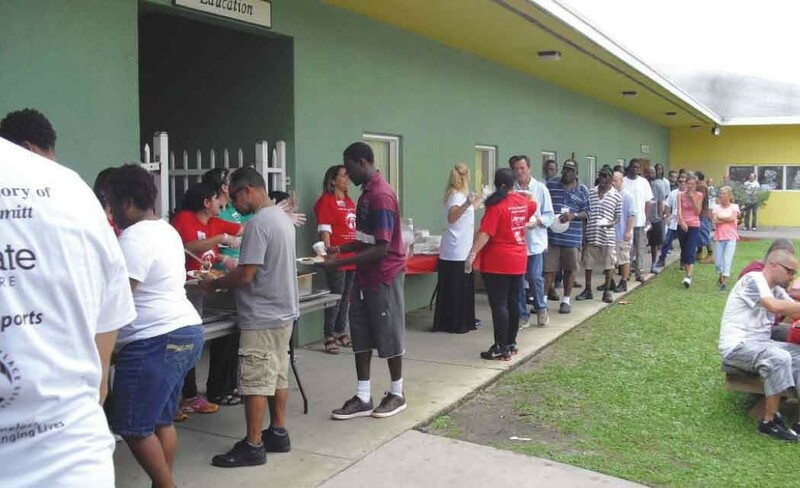 HOLLYWOOD, Fla — Hollywood Broward Outreach Center (BOC) celebrated Christmas with residents and needy families from the community. The day was filled with laughter, Christmas carols, raffles, and a Christmas luncheon with all the fixings. Friends of Broward Homeless along with Oreander Group, and Sherivonne Browne attended to “grant wishes” of attendees and distribute presents. The spirit of Christmas was also in the air at BOC Pompano Beach. Residents and needy families from the community gathered in the pavilion for music and a Christmas message delivered by BOC Sr. Community Development Associate, Nina Corbe. DJ King Hype played Christmas music while Santa, his elves (from Structural Prevention System), and 40 volunteers distributed toys to all children and Mission Hope totes to adults. Kadima Ministry provided the Christmas meal; which was followed by the opening of a toy store with gifts donated by Whole Foods, Lynn Fisher, Lisa Ginta, Hands on Broward, Kadima Ministry, Reach FM, Moss Associates, and BSO; providing an opportunity for attendees to shop for their loved ones.